Or “Doe Rhanna” as it was originally. What’s up with that, me who changed the name a few weeks ago? Whatever. From 2011 by that signature. 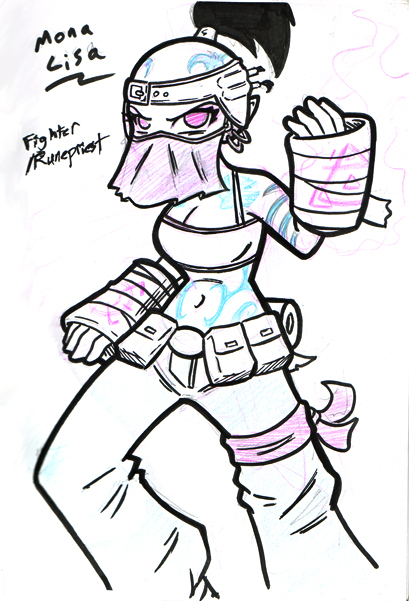 So Doh’ Ranna was very real character I made a few years back. Unlike Angela though, I did it on purpose. 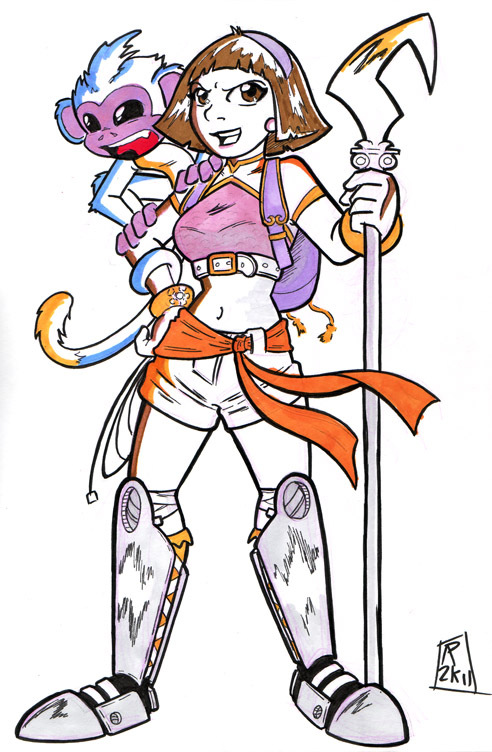 The meta-game was “How long until the other players figure out I’m Dora the Explorer?” The answer was a couple sessions. I basically kept introducing more and more elements that would give it away. I think the monkey’s name was “Boo-tah” or something close to that. Magic backpack. I think it was when I got to some sort of magic map that they got wise. I’m easily amused is the point I guess. 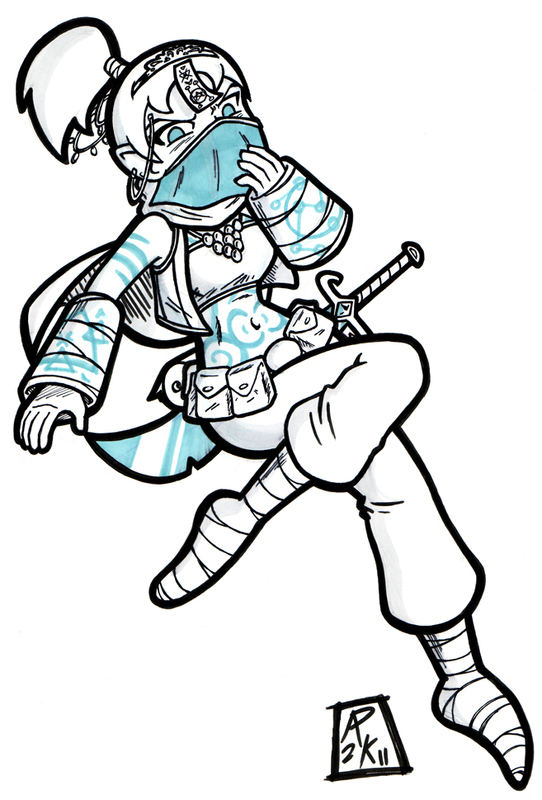 It was in a game of Exalted, and she was part of a group trapped in some kind of weird valley with a mysterious tower. My memory for the specifics is pretty bad. But at some point she got shoes that gave her super-speed, and there was some sort of siege of bad guys on the valley? In which your erstwhile cartoonist talks about recent comics. I really like Sonic the Hedgehog. It’s like my favorite thing. Which can be rough, as there’s been, let’s say periods of time where there hasn’t always been high quality products associated with that brand. But sometimes there is, and this is one of those times. This week saw the release of Sonic Saga Series : Vol 3, which contains a number of quality issues of the Archie Comics series (#170-176), but in particular it contains issue #175, which is my ALL TIME FAVORITE ISSUE of this book. A book I’ve been reading most of my life, mind you. And it’s the issue when Sonic looses. 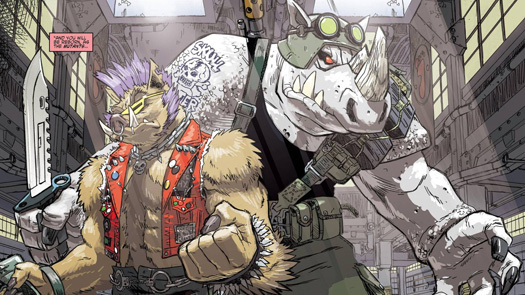 Issue #175 was the moment, just after about a year writing the book, Ian Flynn proved his worth for the rest of time. After 175 issues, he nailed the central conflict of the book, Sonic and Dr. Eggman, better than it had ever been. The issue opens innocuously, but suddenly explodes in tragedy and panic as Eggman’s entire armada appears from nowhere and completely and utterly destroys Knothole Village, Sonic’s home. It happens with no warning, and without a single chance of rebuttal. He wipes out the entire village, and for a second, it seems like everyone gets straight up killed (they don’t obviously). The only one left is Sonic, who you quickly realize was left alone on purpose. Eggman strides out the fire in a massive battle suit, and proceeds to hand Sonic the most devastating beat-down he’s ever received. Physically, mentally and emotionally. The whole thing is really jarring, and pretty great. There’s a certain satisfaction to seeing your favorite character utterly destroyed. Sonic is a character/series that rarely ever gets really dragged through the mud, as often happens with licensed books. This issue is probably his lowest point as a character, and I love it. LOVE it. The cool thing about the comic (and the cartoon it was largely based on), was that Robotnik had already taken over the world, and Sonic and his friends were trying to take it back. A big reversal of most kids entertainment. The big point Eggman makes in this issue is that after 175 issues of fighting him, Sonic has never really “won” in any real sense. They’ve won battles, but they still haven’t won the war. It’s a real harsh reality that he drops, made all the more brutal by the realization that Eggman has always known this, and has kind of just been toying with them for years. Now, obviously Sonic comes back from this. Within the next issue even! But that’s fine. I want to see the hero win, but allowing this sort of loss makes those moments so much better. And there’s consequences! That village is still destroyed, requiring a full change to their base of operations. And at least two characters are massively impacted by these events. One crippled physically, one mentally. It’s pretty intense. Especially for a kids book. 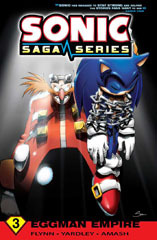 Sonic Saga Series : Vol 3 can be bought online, or at your local comic shop. I didn’t even read 1 X-men book a few years ago. Hardy ever really. Beyond the occasional foray into the giant ocean that is the X-men universe (the Whedon/Cassaday “Astonishing”, and stack of “Academy X” back issues, etc), I’d never really fallen into it. This is now the fifth X-men book I’m reading at the moment, after getting sucked into the insanely fun Wolverine and the X-men, and Bendis’ 2 on-goings, and an X-force picked up somewhere in there. X-men is really cool you guys. Like, in general. 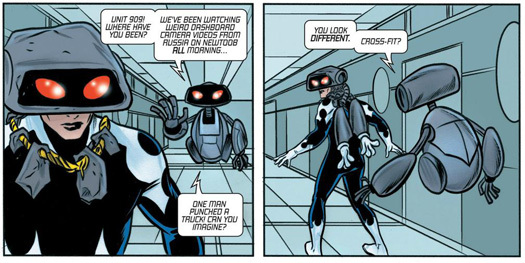 But this book specifically, the relaunched “Adjective-less” X-men, is also pretty cool. So far at least. 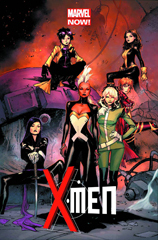 Acting as one of the sort of sub-squads of X-men within the larger community residing at the Jean Grey school, this particular grouping of mutant heroines comes together when two surprising guests come knocking at the school. Villain John Sublime, and longtime member Jubilee, who shows up with a baby. Which is odd, as you might guess, as she did not have a kid last time anyone checked. Coipel’s art was probably the biggest draw for me on this book, and he delivers his expected level of excellence that’s been seen in books like Thor or House of M in recent years. There’s a lot of superhero artists that might make female characters kind of “same-y”, but Coipel does a fabulous job making each member of the all-women team distinct from one another, in both face and body language. The story starts off a nice clip. There’s a few elements introduced that get things moving in the story, although a few of them are sort of only half explained. I’m not familiar with John Sublime, and the baby is only sort of explained so far, but that all appears intentional. It’s easy to follow, just not in a huge rush to spell out the whole story up front. A brief scene near the start seems to be setting up some sub-plots with student characters as well, which I always like to see. The characters all have a nicely defined voice as well. Psylocke’s cold stare and Rouge’s devil-may-care attitude all ring nicely. I could maybe do without Kitty saying “OMG” out loud though (save that for Boom-Boom). A nice catchy opening to the series. I expect the hook to come in the next few so this book can officially combine with all the other X-books into a giant Voltron of taking-my-money. Welcome! To “In Stores POW!”, a semi- weekly feature in which I plan to exposit on something that’s been released in comic shops during the week. Some reviews. Some recommendations. Some pointless whining. Wherever the wind take me. For the inaugural installment, I’m gonna talk a little about the current run of Marvel’s “Journey Into Mystery”, because I am in LOVE with it. The old-school book that debuted and became “Thor”, it was brought back in recent years as a secondary Thor-themed title with a rotating focus. 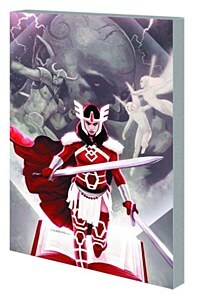 After a much-loved run about Kid Loki by writer Kieron Gillen, this newest version focuses on Sif, Asgardian warrior, and Thor’s wife (I think?). Writer Kathryn Immonen (Runaways, Hellcat) and relative newcomer Valerio Schiti (Battle Beasts, Infestation 2) succeed in a relatively difficult thing: making me really like a fantasy book. It’s not impossible mind you, just a little rare. But JiM hits my buttons in much the same way “Incredible Hercules” did a few years back (which is high, high praise). Immonen has been one of my favorite writers recently, as she’s one of the best around at taking the inherent silliness of superheroes and really playing it for all it’s worth. Applying the same theories to the fantasy lore of Asgard works wonders. It’s all the high fantasy you’d want of the genre, but then Sif just yells down a dragon cuz he’s a jerk. It’s great at shifting gears. It can jump from high action to Shakespearean drama, to giant norse-women sitting in a waiting room. Also, there’s some blood. Mythology and all. My point here is, I love this book quite a lot. It’s one of my favorite books out right now, and I really hope people check it out. It’s kind of what people are always saying we need more of. It’s easy to jump into, it’s fun and lighthearted, it stars an awesome female hero, it’s great. This week saw the release of the trade paperback of the first arc “Stronger Than Monsters”, AND the first issue of it’s second arc with issue #652. In that issue Sif goes to space. As you do. Now, can we talk about how this guy is just Moe from The Simpsons? Aha! I did it! I said I would! You can now find Aptitude Test t-shirts at Zazzle. For those that don’t know, Zazzle is a print-on-demand site. So if you buy one of my designs, they print it up and ship it right to you! It’s a nice simple way for me to dip a toe into merch and see if anyone is interested. Also, if there’s anything else you’d want to see, like other designs or other kinds of merch, let me know! At last! The new site is live! I am very excited about that! A big round of applause for internet wizard Lissa for this amazing looking site. Also thanks to Colin for hosting the comic and managing the site for all those years. But Aptitude Test has grown up and moved out of the house. Got itself an apartment. – Comments: Not only does the blog have proper spam-filtering comments, but now the comic posts themselves can be commented on! You can talk about the comic itself right there! Please don’t hurt my feelings! – Archive: Is still just an archive, but now looks super awesome! Seriously, check it out. Looks great on mobile devices too. – Gallery: All the old Halloween/X-mas/Guest Comics can now be found on the gallery page. Maybe other things? Eventually? – RSS feed: There is one of those things now! People have asked for that for years now. I literally have never used one, so hopefully that works! – Shop: COMING SOON. I should have this ready to go later this week. It’ll be a Zazzle store where you can get some cool AT t-shirts. Is there anything else you might want? Let me know! It’s that time! I’ve played as many of 2011’s games that I wanted to as was reasonable, and have put the best in a list! 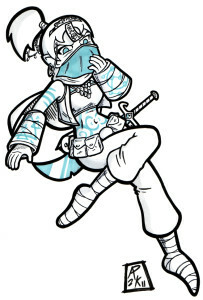 There’s still a few games I didn’t get to, like Skyward Sword or Uncharted 3, but I’m only one person. Get off my back!